Christian Voices had a brand new play for Spring, 2015 – Malachi. A holy man arrives in town to spread the Word of God. Temple and priests in disarray? How can this story resolve itself? In our story Malachi is a learned man of God who is travelling to His people to spread the Word and Law that He has laid down upon them. The people have broken those laws and our story follows the ramifications of those decisions and Malachi’s reaction to each individual concerned. Malachi is the last of the Old Testament prophets. Indeed, the book itself is the last book in the Old Testament. 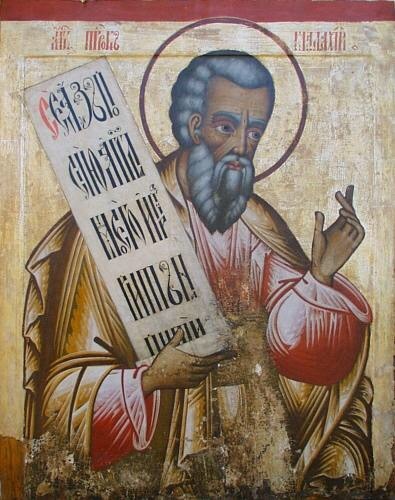 The name “Malachi” means “My Messenger“. As such there is some discussion on whether we’re talking about a specific individual or an anonymous prophet or even a conclave. Whichever it is – the intent is to bring the People of God back to Him and His Law. It is fair to say that some of the subject matter in this short book is difficult in today’s more liberal mind. But we hope we dealt with these issues – without avoiding them – with tact, thoughtfulness and concern for those involved. Some of our characters have a pretty hard time of it in this play. We hope the audience though did not!